Dr. Dutton founded the Weare Animal Hospital in 1992 to practice the type of medicine he wanted; personal, caring and at a high level of medical expertise. To that end, he has invested in the Staff and expanded each year so the Hospital now offers many services that used to be available only at referral centers or University hospitals. He also decided to obtain the coveted American Animal Hospital Association (AAHA) Hospital certification for the Hospital. There are only 23 AAHA accredited hospitals in New Hampshire. Practicing what he preaches, Dr. Dutton has concentrated on a few areas of expertise and excelled. 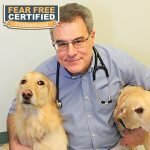 He is one of the few veterinary specialists boarded in more than one specialty, and the only veterinary specialist in the world who has successfully proven excellence in four specialty categories. He is quadrupled boarded: Canine and Feline Practice, Avian Practice, Exotic Companion Mammal Practice, and Reptile and Amphibian Practice. Since 1992, Dr. Dutton has served in a variety of community volunteer positions including the Weare Lions Club, Animal Rescue League of New Hampshire, Weare Animal Guardians, providing free care for the Concord and Massabesic Audubon Societies, Wings of the Dawn wildlife rehabilitation, Cub Scout Pack 24 and Boy Scout Troop 24. He is also called on frequently to aid NH Fish and Game when they receive an injured animal. Dr. Dutton is active in the community and lives in Weare with his wife and two children. He enjoys downhill skiing with his family, gardening, swimming, jogging, and M&M’s. He is owned by two golden retrievers Carly and Emmie, a yellow Labrador Adie, and a cat named The Professor. Always working to improve the health of pets, he has enrolled his golden Carly in the Morris Animal Foundation’s Golden Retriever Lifetime Study, a landmark study of 3,000 golden retrievers designed to understand the high incidence of cancer in golden retrievers. He is the real Captain of the ship and quite proud of his crew.